Next time you log into your Control Panel to respond to a lead or book a gig, we think you’ll be pleasantly surprised to discover your brand new, much improved bidding and booking pages. We've been working on these pages for weeks now, doing everything we can to make them more user-friendly, faster and more reliable. We realize that if you've been with us for a while now, you've probably gotten comfortable using the old booking and bidding pages. We think that soon enough you’ll agree with us that the new pages really are much better. It’s like going from a Ford Pinto to a Porsche 911 Turbo. As we explained earlier this week, by ‘bid page’ we mean the form in your Control Panel that allows you to bid on gig requests (a.k.a. leads). You’ll notice that, while the new bid page looks a bit different – and, in our opinion, better - all of the same functionality is here. Above the surface you’ll mostly just notice a cleaner look. Below the surface this thing really moves! On to the booking page. Next time you go to book a gig (by clicking “Book Now”) you’ll see our much improved booking page. You’ll notice more changes here than on the bid page. Even so, after using it just once or twice, we think you’ll agree it’s a serious improvement. Instead of jamming all of the gig’s information together, we’ve broken it up into Event Info and Client Info. 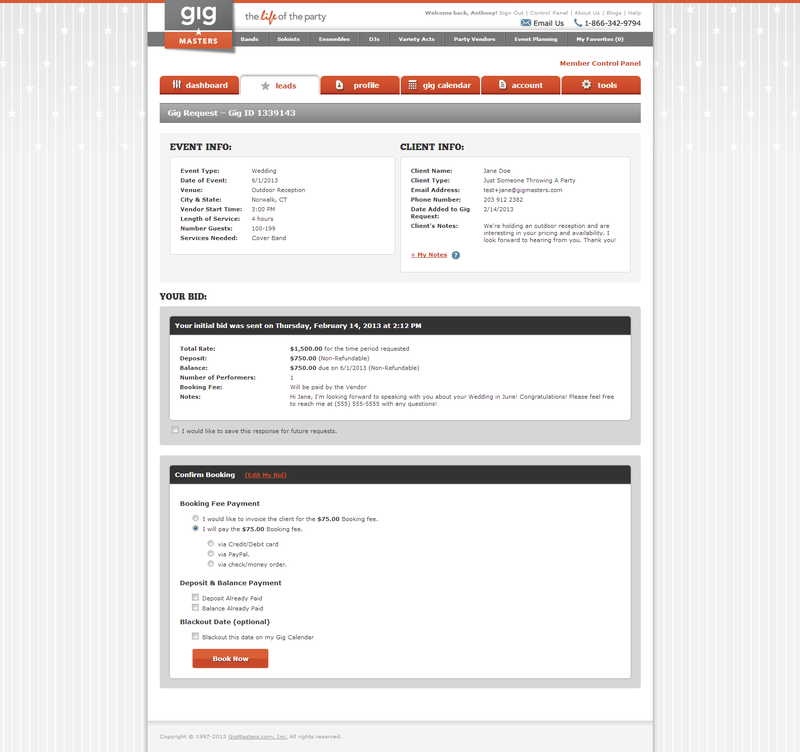 This layout mirrors that of the bid page. This section is pretty self-explanatory. It contains all the details of your bid. Note the option to save the response for future requests. Now when you choose to pay the booking fee, you can do so right from this page. Just choose “I will pay the $---- Booking fee” and you’ll have the option to pay by Credit/Debit card or PayPal. You can pay without leaving the page. Cool, right? You can also now edit the details of your bid just by,you guessed it, clicking the “Edit My Bid” link. This triggers a pop-up where you can edit any and every aspect of your bid. 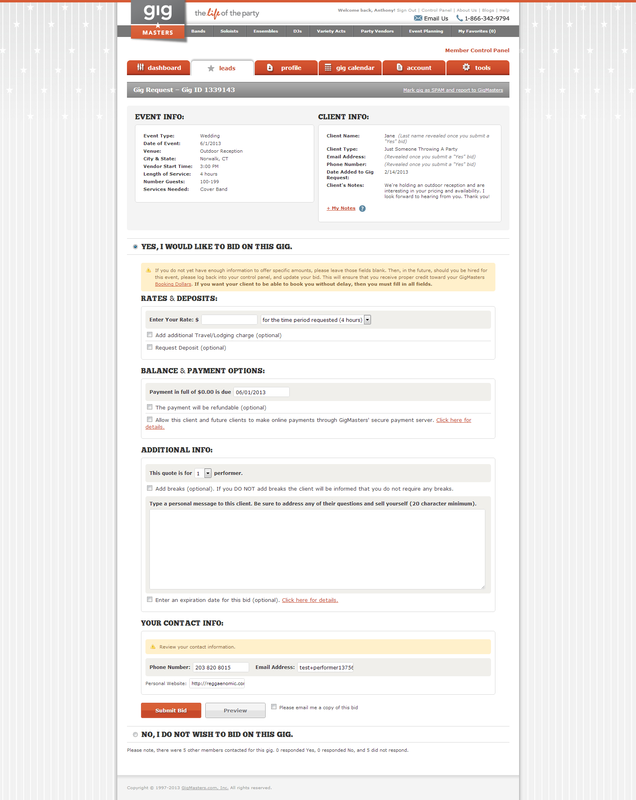 *Note: Editing your bid from this page triggers an email to your client alerting them to the details of your changes. That’s it folks. That’s what you need to know about the new bidding and booking pages. While these changes may be a little jarring at first, we think you’ll agree these important pages are now easier to use and easier on the eye. If you have any questions about this or anything else related to your membership, please feel free to contact us at any time.